Derek Harold Richard Barton was born on 8 September 1918, son of William Thomas and Maude Henrietta Barton. In 1938 he entered Imperial College, University of London, where he obtained his B.Sc.Hons. (1st Class) in 1940 and Ph.D. (Organic Chemistry) in 1942. From 1942 to 1944 he was a research chemist on a government project, from1944-1945 he was with Messrs. Albright and Wilson, Birmingham. In 1945 he became assistant lecturer in the Department of Chemistry of Imperial College, from 1946-1949 he was I.C.I. Research Fellow. In 1949 he obtained his D.Sc. from the same University. During 1949-1950 he was Visiting Lecturer in the Chemistry of Natural Products, at the Department of Chemistry, Harvard University (U.S.A.). In 1950 he was appointed Reader in Organic Chemistry and in 1953 Professor at Birkbeck College. 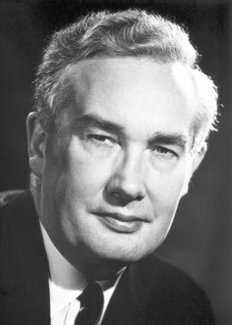 In 1955 he became Regius Professor of Chemistry at the University of Glasgow, in 1957 he was appointed Professor of Organic Chemistry at Imperial College, which position he still holds. In 1950, in a brief paper in Experientia entitled “The Conformation of the Steroid Nucleus”, Professor Barton showed that organic molecules in general and steroid molecules in particular could be assigned a preferred conformation based upon results accumulated by chemical physicists, in particular by Odd Hassel. Having chosen a preferred conformation, it was demonstrated that the chemical and physical properties of a molecule could be interpreted in terms of that preferred conformation. In molecules containing fixed rings, such as the steroids, there resulted a simple relationship between configuration and conformation, such that configurations could be predicted once the possible conformations for the products of a reaction could be analysed. Thus the subject “conformational analysis” had begun. Barton later determined the geometry of many other natural product molecules using this method. Conformational analysis is useful in the elucidation of configuration, in the planning of organic synthesis, and in the analysis of reaction mechanisms. It will be fundamental to a complete understanding of enzymatic processes. Lecturer of the Chemical Society; 1961, Falk-Plaut Lecturer, Columbia University; 1962, Aub Lecturer at Harvard Medical School; Renaud Lecturer at Michigan State University; Inaugural 3 M’s Lecturer, University of Western Ontario; 1963, Hugo Müller Lecturer of the Chemical Society; 3 M’s Lecturer at the University of Minnesota; 1967, Pedler Lecturer of the Chemical Society; 1969, Sandin Lecturer at the University of Alberta; 1970, Graham Young Lectureship, Glasgow. In 1958 Prof. Barton was Arthur D. Little Visiting Professor at Massachusetts Institute of Technology, Cambridge, Mass. ; in 1959 Karl Folkers Visiting Professor at the Universities of Illinois and Wisconsin. In 1954 Derek Barton was elected to Fellowship of the Royal Society, in 1956 he became Fellow of the Royal Society of Edinburgh; in 1965 he was appointed member of the Council for Scientific Policy of the U. K.; in 1969 he became President of Section B, British Association for the Advancement of Science, and President of the Organic Chemistry Division of the International Union of Pure and Applied Chemistry. Professor Barton holds the following honours and awards: 1951, First Corday-Morgan Medal of the Chemical Society; 1956, Fritzsche Medal of the American Chemical Society; 1959, First Roger Adams Medal of the American Chemical Society; 1960, Foreign Honorary Member of the American Academy of Arts and Sciences; 1961, Davy Medal of the Royal Society; 1962, D. Sc.h.c. Montpellier; 1964, D. Sc.h.c. Dublin; 1967, Honorary Fellow of the Deutsche Akademie der Naturforscher “Leopoldina”; 1969, Honorary Member of Sociedad Quimica de Mexico; 1970, D.Sc.h.c. St. Andrews: Fellow of Birkbeck College; Honorary Member of the Belgian Chemical Society; Foreign Associate of the National Academy of Sciences; Honorary Member of the Chilean Chemical Society; D.Sc.h.c., Columbia University, New York; 1971, First award in Natural Product Chemistry, Chemical Society (London); D.Sc.h.c., Coimbra (Portugal); Elected Foreign Member of the Academia das Ciencias de Lisboa; 1972, D. Sc.h.c. University of Oxford; Longstaff Medal of the Chemical Society. Derek Barton was first married to Jeanne Kate Wilkins but this marriage was later dissolved. He is now married to Christiane Cognet, a Professor of the Lycée français de Londres. He has one son, W.G.L. Barton, by his first marriage. Barton, Derek H.R., Some Recollections of Gap Jumping. Oxford University Press, Oxford, 1998. Sir Derek Barton died on March 16, 1998.